AND… I’ve made my decision on what my next 5th wheel will be! I’ve been in the market for a new fifth wheel for about 18 months now. I’ve looked at MANY manufacturers models with a focus on design and engineering over “bells and whistles”. 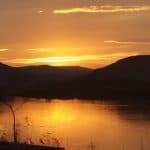 Having lived in a reasonably good Crossroads Seville since 2011, and “tested” it in winter conditions where over 250 inches of snow fell in a winter and temperatures regularly fell WELL below Zero Fahrenheit, I know what to look for and have a good idea of what will “hold up” for the long run. Two 5th wheel trailers have caught my eye in a true sea of mediocrity in the RV world – these are the Glacier Peak model 30’s, brand new this year and the Augusta RV Ambition model 33. Both have many fine attributes and in many ways excel beyond their peers – but only one survived my head to head comparison. Incidentally, both are at a length I consider optimal for full-timing. They are just under 35 feet (real length). Yes, I’d agree that longer fifth wheels are REALLY nice to live in, but they are equally as difficult to maneuver into the more remote (and best) camp sites. Thirty five feet represents a compromise – large enough to be comfortable and small enough to go (almost) anywhere. 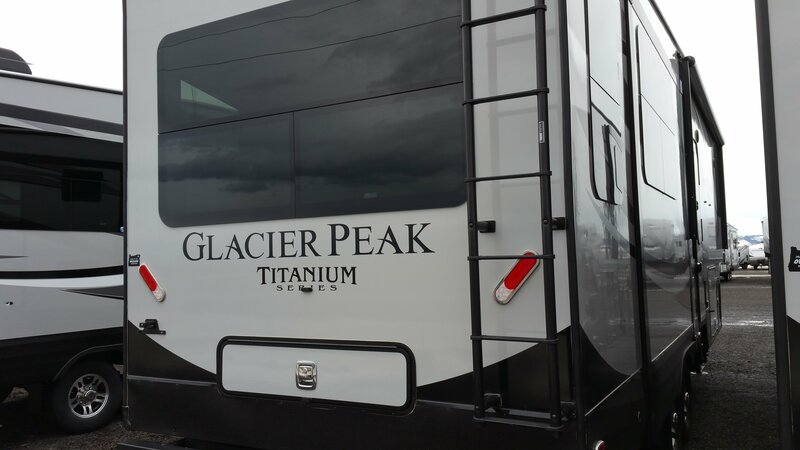 Glacier Peak is manufactured by Outdoors RV, a relatively small company located in eastern Oregon. They claim to know their buyers and make rigs (fifth wheels and travel trailers) designed for heavy duty, off-road use in all types of weather – including heavy snow and low temperatures. Yes, the interior of the Ambition 33 is GORGEOUS, but does it have what it takes where it COUNTS?? See the comparison chart below! 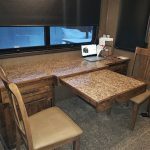 As I studied each fifth wheel, I have to admit the Augusta Ambition is GORGEOUS inside and frankly I like the layout better than any Glacier Peak – but – for me to spend my hard earned dollars with Augusta, it HAS to stand up to certain specific criteria before I can consider spending my hard earned bucks on it. To settle the “face-off” between Ambition and Glacier Peak, I developed a comparison chart (below) that details specific issues I consider important in a fifth wheel and my findings with each trailer. I have had Coach-Net for years now – far more than simple emergency road service. Simply put, I wouldn’t be without it. Insulation 2″ high density, solid foam in all walls including slide walls and top of slide 1 layer fiberglass and 1 layer R14 foil including slide walls and top of slide Glacier Peak – a clear advantage, important in winter AND summer. High density foam beats fiberglass/r-foil any day! Composition of the underside of the slide (the slide-ski) High gloss fiberglass High gloss fiberglass TIE – both are excellent! It’s amazing how many companies cut corners in this important area – one that will cost the owner down the road. suspension MORryde 3000 + shock absorbers on both axles MORryde 4000 Glacier Peak – shocks make a BIG difference, amazing more companies don’t provide shocks on their axles. refrigerator 12 cu ft Norcold with winter kit and heat tape 20 cu ft LG residential Glacier Peak – residential fridges will drain your batteries in less than 24 hours if you dry-camp AND they have NOT stood the test of time. 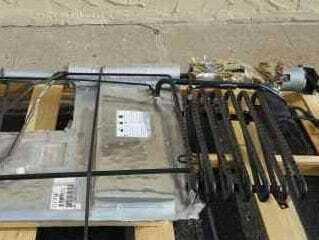 LG did not design their fridges to do 60mph down pot-holed highways! Grey and Black Tank Pulls NO cable system in use Uses cables Glacier Peak – cable systems are prone to fail. Weight 12075 (dry), 2655 (hitch), 15000 (gvwr) (this is on the 30RDS model, the other 2 are very similar) 14500 (dry), 4100 (hitch), 19180 (gvwr) Glacier Peak – The Augusta will require a 1 ton Dually (minimum) whereas the GP requires a 3/4 ton SRW. Diesel is recommended for both. Glacier Peak has 3 models ranging from 33′ 9″ to 34′ 11″, the Ambition 33 is 34′ 6″. For a smaller trailer, it IS heavy and my concern is you need MORE truck than many folks own. Personally, I will NOT get a dually as I spend lots of time in the snow in the winter. I had also hoped to get photos of the storage bay in the Augusta as the sales rep Colin promised me, but he never followed through to send me photos or any additional information as I requested of him. So…I’m done! 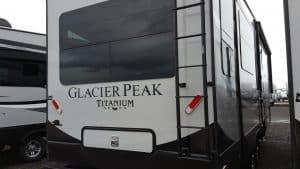 Glacier Peak by Outdoors RV it is – this will be my next fifth wheel! All I need to decide is 30RDS or 30RLS – both of which are great (and frankly, for those who like a rear kitchen, the 30RKS is THE choice to make!) 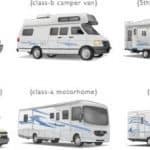 I took the time to make this detailed comparison as Augusta RV seems to make a solid fifth wheel and does offer *some level* of competition to Outdoors RV’s Glacier Peaks. Had I chosen a different manufacturer – particularly ANY from Thor or Forest River, there would be virtually NO basis for comparison. This is a very impressive comparison of “like” 5th Wheels. The check list created will help when we look to upgrade. I was already leaning towards Glacier Peak! Great rig! Now, the model selection to do. Then get a truck. Yep, I’m now hearing they’re (the factory) not planning another run of model 30’s for several months yet – likely to Christmas or even longer. At the moment, what dealers have in stock is all that’s available. We here in Casper Wyoming currently have two 30 RKS models – one platinum and one mountain. As to a truck, 3/4 ton diesel will do fine – my preference? Ford. If you end up purchasing from another dealer, I can still supply you with a great price on the extended service contract. Alan, did you consider any of the Northwood Manufacturing products? The new Arctic Fox 28-5C has dual-opposing slides. I’m sure its a nice trailer BUT it compares more closely to the Glacier Peak 26 models – which I would never full time in. Yes, it has dual opposing slides, but it is a mid-profile trailer, not a high profile. Here’s the key differences: First, at 31’11”, its a couple of feet shorter than I’d like (that’s not what makes it a mid-profile though!) 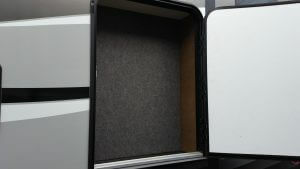 The bed is “north-south” offering only a (tiny) wardrobe slide for clothing – in contrast the Glacier Peak F30RLS and F30RKS have an East-west bed and that allows the entire front cap to be a (giant) closet. While I am impressed with the 28-5, the bed/closet situation to me is a non-starter. I’m sticking with the 30RLS. What do you define as mid-profile vs full-profile? I thought the Northwood Arctic Fox fifth wheels were full-profile and the Northwood Fox Mountain fifth wheels were mid-profile. Interesting. Learned something new, as I thought the difference was the height of the ceiling in the bedroom. Regardless of whether you call the 28-5 a mid or full profile, the fact is the wardrobe slide is small and insufficient for full time living (for most people). The only products I’ve seen pull off a decent wardrobe slide are some toy haulers – like Fuzion. Fuzion is frankly the only keystone product I’d own. Do you ever compare toy haulers? My wife and I want to retire in about 5 years and want to run a business out the back of the toy hauler. I am mostly looking at quality issues. Thanks. Thank you, we really interested in 5th wheel toy haulers. Looking forward to your article. 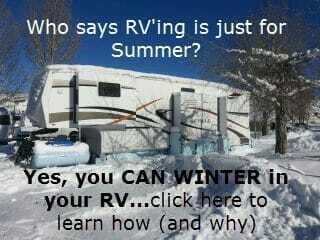 Since you rv in very cold weather, I understand your decision. We will be heading for warmer climates, so an Augusta rv will be in our future! Cold or warm – good insulation helps immensely. 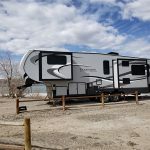 When I’m out on our RV lot on a hot summer afternoon and I walk into an Outdoors RV trailer or fifth wheel and then walk into virtually anything else, there is a 10 – 15F degree temperature difference between the two! Simply put, good insulation keeps you cooler in the summer (less work for your a/c and less cost to electric if you pay) and of course warmer in the winter. Roz, my comment is the same as I made earlier – please read my reply and think about it. We also did an exhaustive review of Arctic Fox, Glacier Peak, Grand Design, and Augusta. 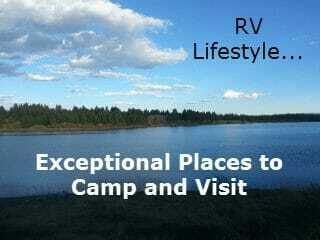 We went to the Airstream, Northwoods and OutdoorRV factory tours. We just bought a 2017 Glacier Peak F26RLS this week from Sumner RV in Sumner, WA. we live in Ohio and bought from an Oregon manufacturer. Congrats! What were the deciding factors that made you pull the trigger for the Glacier Peak over the other 5ers you were considering? I’d love to hear what the differences and similarities are between Arctic Fox and Glacier Peak. Dan, my take on that issue is the glacier peak is far better appointed inside; also the new model 30’s have dual-opposing slides, arctic fox has the 29-5k, which only has 1 slide in the living area. Allen, do thermal pane windows “sweat” as they do on normal single pane windows in the chiller season? We will never get into the winter time conditions like you, but we do like the shoulder seasons here in Ohio from late March to Thanksgiving. We bought an Ambition 33 after also doing a comparison. We were treated poorly by Outdoor RV. They refused any alternative furniture options. Furniture was cheap and we wanted an upgrade. The GP floor plans were poorly thought out. You have to look through the kitchen to see the TV. The I-beams on the GP are 8″. Ambition is 12″. GP has 7,000 pound axels, Ambition has 8,000. Ambition has option to upgrade suspension which we wanted. Standard tires on Ambition are H. So, lots of additional things to consider. BTY we have been in our Ambition in 14 degrees it was perfect. When you say you were treated poorly by Outdoors RV, was that the factory itself OR a dealer for their product? As to furniture, yes, it is not a custom built coach, so, what it comes with (as per the package you order), is what you get. Few if any manufacturers will change furniture. That said, you always have the option of customizing the interior as you see fit after purchase. As to the furniture being cheap, I’ll agree in some cases, it was not the greatest, but in the past 6 months or so, they’re using a new furniture vendor and it IS better. Please realize that for the money (or virtually any money) there IS NO BETTER MADE TRAILER – and I’d FAR prefer they spend their money on chassis/construction/engineering than couches! As I noted earlier, you can always change couches/furniture. As to I-beams, here are the facts: The mid-profiles are 8″ I-beam for main rail & dropped rail.The full-profiles are 10″ main rail & 12″ dropped rail. Please understand, the 26 and 28 models made by Glacier Peak/Outdoors RV are mid-profile rigs, the 30 is a full profile, as you never replied to me privately, I have no idea of what model you were considering. The only models I’d consider to compare to the Ambition 33 would be the GP 30 models. As to axle weight, it is commensurate to the weight of the trailer – the Ambition is (frankly) bloated with a dry weight of 14000# and a GVWR of OVER 19000# , thus knocking out ALL regular trucks except a 1 ton DRW. Ambition’s upgraded suspension STILL does not include shocks! Really?? As to tires, they too match the weight of the trailer, H is needed for Ambition, G is fine for GP. As to being in 14 and it being “perfect”, was that for a day? a week? a season? I personally spend the ENTIRE winter where 14F is considered MILD. So, I require the BEST insulation (again – better on GP than Ambition) and the BEST construction (possibly equivalent, but given the QC issues I’m seeing reported by Augusta owners – I may have to give that to GP. The fact is the GP models that were built in February were their FIRST RUN and even those have proven to be virtually flawless (we sold 2 GP trailers from that run and neither is back with ANY issues); I am CERTAIN their 2nd run (on which mine is being built) in September will be EVEN BETTER with some updates and upgrades on these new 2018 trailers due to hit the street in late Sept/early Oct. 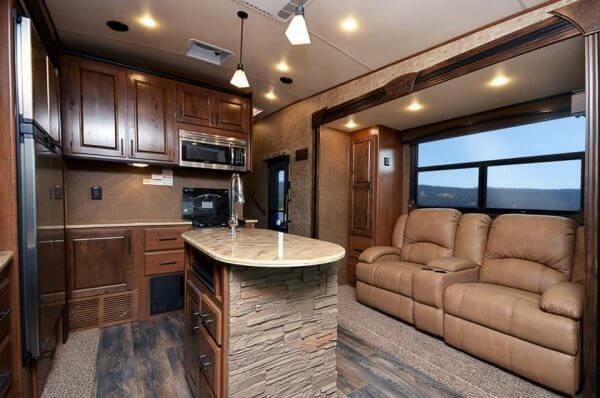 I see the carpet on the side floors, if I were buying a new RV, any type, and could custom order, that carpet would not be installed! I don’t appreciate carpet at all! It gets extra dirty extra quickly, and it’s hard to keep clean. I am full-time in a Class A.
I personally like carpet in the bedroom, and virtually all companies use carpet in the slides. With most companies, custom orders are not possible – if they were, you’d pay MUCH more for a trailer! Great article, I appreciate the list of comparison features and I will use it to compare the brands I am looking at. Will be doing a factory tour of Grand Design in a couple of weeks. Did you ever do a write up on the Lance brand, they seem (to my untrained eye) to be well made. I am also considering a bumper pull instead of a 5th wheel as option 2 for fulltime travel. I recently spoke with some insiders at Grand Design and there are several key areas where Grand Design fails. Too bad, because I really liked the floor plan on the 310 5th wheel. Problem areas include: No shocks; No protection above the tires (recall – outdoors rv uses a steel plate); Tires are Chinese (avoid!! ); underside of slide is NOT fiberglass – there were other issues but these were the big 4. I’ve looked at Lance, their truck campers are good, but their travel trailers do not compare to Outdoors RV (or Arctic Fox). Why a travel trailer instead of a 5th wheel? Alan have you done any reviews of the open range 3x 5th wheels. I will be retiring this winter and we are considering the full-time route and looking for a well constructed and insulated unit. Can’t trust everything you read on the internet but I have come to trust your evaluations. Thanks in advance for any input. I watched their 15+ minute construction video – they do a great job presenting themselves, not so much when it comes to the “finishing touches”. I recall seeing nothing about steel plates over the tires (to prevent damage to the interior of the coach in the event of a blow out), same goes for 2″ solid foam insulation – none; no use of shocks on the axles, etc. My money would still go on the Outdoors RV or Arctic Fox. Honestly, in the smaller class, the Glacier Peak F30 models are phenomenal (34ft overall), and for larger, I’d go Arctic Fox (32-5 and up). Hi Allen: I’m new to the RV industry. I’m a retired general contractor of 47 years, so I do know a thing or two about construction. My research in last 2 months has included DRV mobile Suites, Augusta Luxe, The Grand Design all 5th wheels and a few more. Up till just reading your comparison of Glacier Peak VS. Ambition (which I was contemplating) You have peaked my interest in the GB . I currently have a F350 and was planning to buy a dually. We want a 5th wheel around 34′ for using at least 6 month a year. 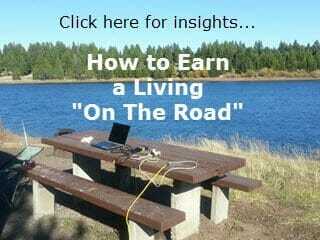 Have you compared the GB to DRV Mobile Suites. Yes they are very heavy but I love the 14″ frame. I will research the GBF30RKS . Love your post. I didn’t even know they once built a 34′. I was interested in the 38 RSSB3, 38′ 4″ AT 17,100 GVW full capacity. A bit pricey but you get what you pay for. It’s well insulated but not as well as the F30RLS. The steel I beam frame is outstanding. I’m not looking for a 5th wheel that will survive winters. That’s not our goal. I want a unit we can use 6 months a year and will last many years. I’ve looked at Montana’s, Grand design, Landmark. Cruisers and none have the quality of DRV or Augusta as far as I can tell. I am interested in the F30RLS. I like the layout and quality. What’s standing in my way is the have no washer/dryer hook up. I don’t know if that’s even a possibility in these units. Thank You for your time. The F30RLS I believe is 12 to 10 inch ibeam construction – its a 15000# GVWR trailer; as to comparing to DRV, the dealer I work for carries DRV and we have a 38 Aire – its the affordable one on their series (115,000. retail) – the DRV has NO shocks, NO steel plate separating the tires from the inside of the coach; insulation is comparable, quality of construction (frankly) goes to the Outdoors Glacier Peak. I like the cabinetry better. The DRV does have “closing drawers” and very adjustable shelves, and a (somewhat) more sophisticated heating and plumbing system. But… if you want a FULL drv – not the “aire” series, you’re looking at retails of $150,000 to well over $200,000. Further, I’ve found the difference between 38 ft (real length) and 34 ft is significant. There are many camping sites I had trouble either getting into or even reaching at 38 ft. (And the 38 Aire is really 40 ft). As to washer/dryer – no in a Glacier Peak. I am no fan of w/d in a rv. Happy to use laundramats when I need. Thank You All. Of course the W/D issue is my wife’s decision. Don’t know if that’s a deal breaker for her or not. Were looking at some Glacier peaks tomorrow. I certainly am all about making life easier and safer. Maneuvering a 34′ in camp is a lot less nerve racking than a 40′ for sure. And I really don’t want to buy a dually just to pull a 5th wheel. I love my 350 and want to keep it. I’m glad I came across your site this morning. I would have never known about Glacier Peak. Where in the nation are you located? Gilbert AZ. There’s a dealership 4 miles from my house in Mesa. Robert Crist and company. They sell DVR and Glacier Peak. I looked at the Mobile Suites there 2 times already. I saw the Glacier Peaks parked next to the DRV’s but paid no attention to them, and the salesman never mentioned them to us. They had at least 10 units on the lot. Do you by any chance know anything about the Vanleigh RV. I researched them this morning and found it very odd that they post no specifications anywhere on frame construction, tires, shocks. axle, insulation etc. I find this to be very suspicious. I know they recently had a recall because the mislead the customer as to there towing capacity. All they show and talk about is the eye candy . Some believe Vanleigh to have a good reputation; I too do not know the details as I did not bother to call them to discuss their model 325. I wrote it off after discovering it has a 54 gallon fresh water tank – this to me is a clear indication that they “don’t get it” and likely there are other deficiencies. But to me a 54 gallon fresh water tank is a deal breaker – the Glacier Peak has 80 (or 82) gallons and having been ‘in the field’ now for nearly 6 years, I consider that necessary. The dealer for Glacier Peak was not open today. We did go to another dealer and looked at the Vanleigh Vilano 375 FL. Was not impressed at all with quality or frame. No protection at wheel wells. hard plastic under belly shield. looked like a 12″ I beam frame. The draws at cabinets are very weak. I think they use OSB instead of 5/8″ plywood on deck. this I observed from a picture. low grade furniture. Hi Allan: My wife and I looked at 2 units Monday. She liked the lay out of the F 30 RLS. W/D and dishwasher is nota issue with her. Upon my inspection of the unit, when looking in basement into cavity where the plumbing is I noticed the top frame consisted of 2×3 lumber. Using wood in a 5th wheel concerns me. Why doesn’t the factory use a 20G metal stud instead. or a angle iron structure. Also I can’t find any factory tours on You Tube or any other sites. I would like to see how these units are actually put together in the factory. My other concerns are cosmetic. The unit we viewed had broken blind slats, the closet sliding doors didn’t slide easily on the track and the kitchen draw construction of the draw box is very weak. Is it possible to visit the factory and do videos exist on line of factory operations. Glad you got out there to see a couple. Regarding the use of wood over metal/iron, I suspect its a weight issue, but I’d encourage you to call the factory in Oregon and ask them directly (then report back to me, as I’m curious as well). I believe the use of wood there is consistent through out the industry. As to videos – go to outdoorsrvmfg.com and you’ll find several videos (search their site as its not the best layout of all time!) and some show some of the construction. Your best option is a visit to the factory where they take you through from soup to nuts. Bob, Sorry for the delayed reply. I work for a dealer who carries DRV so I’ve seen it up and close. The DRV is truly a nice 5th wheel – BUT – you need to understand their product line. 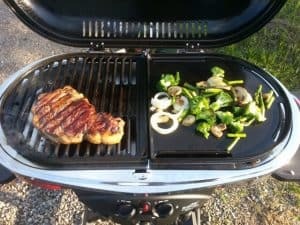 The “aire” is the least expensive line and is available only as a model 38 and model 40 (about 40 and 42 ft bumper to hitch) – for me this is too long. Further, to achieve a “low” price point (MSRP of about $120,000), they went to a commercial Lippert chassis (I’ll take northwoods chassis any day over this- and that is what can be found on the Glacier Peak trailers). There are a few areas where the DRV Aire excels beyond the Glacier Peak, and there are a few areas where the GP beats the DRV. BUT… the Glacier Peak has a MSRP of about 75,000. compare to 120,000 for the “cheap” DRV. The pricier DRV’s are all over (or well over) 150,000. and NONE are a true 34 ft bumper to hitch… so I personally wrote off DRV for myself. The DRV Select & Elite are also built on a chassis that requires a very heavy duty truck / freightliner and you can not even consider a 3/4 ton, or even a 1 ton SRW diesel for these upper models from DRV. How are you? It’s been a while since I looked at your blog/vlog. I’m glad you checked out the Ambition. Hope you love your new 5th Wheel. Moore Ride Independent wheel suspension (no axles). Gel Coat Paint on the full exterior. Upgraded 3 1/4″ thick insulated walls up from 2″ thick in the Ambition. Soft touch covered walls that add insulation, quietness and a softer nicer look. To me it’s the ideal way to go. Look forward to catching up with you sometime. Galen, Yes, I had a long conversation with Colin at the factory and found several key failures in the Ambition when compared to the Outdoors RV Glacier Peak. I detail these in my article comparing Ambition to Glacier Peak. With respect to Luxe, yes its a nice trailer, but given how ALL trailers depreciate like a rock, and combined with the fact that the Glacier Peak is priced VERY competitively – even against the Ambition, I placed my order for a Glacier Peak and am now awaiting delivery of my new 5er. I wish you the best and hope you take your trailers shortcomings to heart and consider updating to make it truly competitive with the Glacier Peak. Hoping to receive notification of new posts. If you signed up on the webpage for the mailing list, it should work! Thanks for posting, comparison is on 2 of the 3 manufacturers that we were looking at (+New Horizons). I really like the ORV (Northwood/AF) but after pouring over all of the sites that I could find and in emails with users I decided to go bigger with the Augusta Ambition (RV Factory) 38-FB. Really like the bath and a half and interior storage space. Some things I would have changed, but not many… liked the full weld on aluminum studs at 16″ and heavier I-beam frame, cabinet construction, not as concerned with a slightly thinner wall as plenty of users had no issues in cold/hot weather. Paid more than I wanted (still under $80K) but with Mor Ryde IS (9K), a GVW of 21.5k for a 16k trailer it provides a lot of weight to work with. Trade-off, now looking for a DRW truck to tow it with… that was not a deal breaker for us. Good luck with it. Let me know if you’d like an extended service contract. I can get you a great deal on that. As far as the Ambition 38, I hope you enjoy it and don’t find that you’re blocked from camping in too many campsites (my experience is otherwise with a 40 ft trailer). As to truck – to me that’s easy – a Ford F350 and if you get a DRW, don’t plan to spend too much time in areas that get lots of snow while you’re there. They are not as good as SRW trucks. And of course, get diesel! Augusta is no longer manufacturing the Ambition for 2017. They made a new model called the Augusta Luxe Gold that replaces the Ambition. It will have a new design that includes a bulkhead of cabinets around the living room. Personally I don’t like the bulkhead because it is more space to put junk and add more weight. This 5th wheel from what I heard will come in a 36′ length. There is no info on their site yet , so call the factory and talk to a rep. Also this units weight is a bit over 19,000 , so a dually is a must. Bob, When I spoke with them a few months ago, Ambition was still current; if they’ve changed it, it will be interesting to see if they address the deficiencies I’ve noted in my report. The weight of 19000 also concerns me – it knocks many folks out of the market and I truly wonder if a camper needs to weigh that much to accomplish what they’re after. The change was just announced a couple weeks ago. I spoke with Deb Smuchker. I’m still trying to decide between the Augusta brand and Forest River. 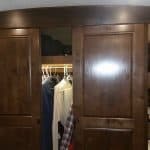 Augusta uses all wood doors, trim, residential cabinets and appliances. That alone adds a lot of weight. But there built for longevity. The couple Forest River 5th wheels I looked at didn’t come close to the quality as the Augusta brand. Yes the cost is high and the weight is ridiculous but if you can afford the truck to pull it, and the unit it’s worth the long term investment. The only plus factor I found in my research is Forest River is a true 4 season camper. Augusta is not. I noticed trim coming loose on 2 units. The cabinet draws and doors are not built to last. The frame and suspension is good quality along with sidewalls and roof . To me a brand new unit sitting at a dealers lot should not have trim falling of the walls. That’s a huge red flag . Curious, was trim coming loose on the Forest River or the Augusta? Is Augusta not a true 4-season? sorry , I meant Glacier Peak and not Forest River. Looking at to many units and getting confused. the unit I looked at was the F30RLS. It’s a 2017 new unit sitting at a dealers lot. They have 5 units. Every unit has issues with trim coming loose. I have never noticed any advertising on any Augusta sites that states their units are 4 season. Most sites that I have looked at have Augusta products listed for full-time. Just one article. That being said, I do not know if Factory Direct includes the full-time comment in their literature. 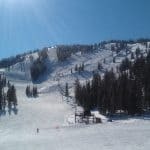 Al; I’ll be in Steamboat Springs in 2 weeks. How long of a drive is it to your dealership from there. I’m thinking about going up to see what you have in stock. I’m interested in the F30RLS. I’m hearing that orders are taking 6 months or more. The Luxe Gold is 39′ long which is longer than what I’m interested in. Hi Al: Are you still camping or back at work. My wife and I just looked at the 2018 Glacier Peak F30RKS Titanium and the Blackstone class 270RKS titanium series. I’m leaning toward the 5th wheel. My cousin just spent the entire summer in Alaska. He has a 24′ trailer and has no issues finding camping spots at state sites. My other cousin who also went to Alaska with them has a 28′ tow behind trailer and he had trouble getting spots at the same sites because most sites were not level or big enough for his camper. Bob Lacourse: We spent the summer in Alaska in 2016 (110 days) in a 25′ travel trailer. Never had any issues finding a spot. We did a lot of Alberta, BC, Yukon Provincial Parks. In Alaska we did state parks, city parks, BLM’s US Forest Service and also some private campgrounds. Actually being a RVer from Ohio who goes to the state and national parks in Ohio, PA, NY, WV, KY, VT and NH. there are far more issues reserving a level campsite here than Canada and AK.. But one thing I have noticed in Canada and Alaska is the use of telephone type logs 18″ – 24″ (horizontally) tall in the back of a campsite pad. Without the bump-stops you could fit a 40′ RV into that site. There were no trees blocking the back in space. But with the poles you are limited to 30′ of pad space. We always found plenty of sites we could fit in as to not have to un-hook. But usually we arrived by 2-4 in the afternoon. There were a few small state parks (10 – 25 sites) that did fill up well after dinner time. Or a person rolled in late evening with a 44′ 5er toyhauler who missed out on a site. Our new RV trailer is a 29′ Timber Ridge which we are taking back to Alaska also next summer (2019). Thanks for the info Al. We plan on spending the summer in Alaska in 2019 also. I’ve started my research and planning a couple months ago. I thought I saw on your blog that you purchased a new 30 RLS Titanium 5th wheel and not a 29′ as mentioned in your reply. My cousin mentioned that they stayed in all BLM camp sites, and they almost always checked in around 3 to 4 PM. I look forward to your next blog about this issue, and hopefully some great feedback from RVers that spent this past summer in Alaska. I have a 2014 F350 Lariat single rear wheels. I’m guessing this will pull the 30RKS just fine. I’m going to make a video and post to address your concerns and perhaps help you identify the best towable (tt vs. 5th wheel) and length for your needs. I’m still skiing and doing alot of it. I will do my best to get a post done in the next few days, but no promises. Best advice, stay tuned! I am in contact with my store and can do business, I quoted a fellow on a 30RLS a day ago, and we may have a 30RKS still in stock – but when that 5th wheel sells, I know I won’t see another until OCTOBER!! The manufacturer has announced they will not do a 5th wheel build until early Autumn. The Glacier Peak you saw was a 1st build of that model, there have been several changes (improvements) in the 2nd build. Mine was completed in mid-October. You can trust that Augusta is a 4 season (as is the GP), but NOT FR. Buzz, see my comment (just posted) to Bob, I’m CERTAIN it would be a FR with falling trim! I came across you blog while researching 5th wheels. I have been looking at the GP, Artic Fox, Luxe, and New Horizons. My question to you is if you have ever looked at the New Horizons 5th wheels? My wife loves the look of the Luxes but I told her we would have to look more into how they are made then just the looks. I looked at some of the New Horizon videos and I’m impressed with it. What do you think? The New Horizons are VERY well made campers BUT they are HEAVY and VERY expensive (typically $200,000+) – when you can get a Glacier Peak (realistically) for mid 60’s to mid 70’s (out the door), and when you see these things depreciate like a rock, I can’t justify the cost of a New Horizons – even though they clearly ARE a superior product. I agree with Allen’s above statement 100%. You get a lot of bang for the dollar going with a Glacier Peak. But if money or towing capacity is a none issue, the New Horizons $150k to $200k price will sure keep some executives very fat and happy. We bought the Outdoors RV travel trailer (Timber Ridge) last month. Traveled 4500 miles to buy it and tow it back. This thing is built rock solid, and the MorRyde 3000 suspension with the X4 / gas Monroe shocks was the icing on the cake. It just floated over the bad roads (I-80) in Illinois and Indiana. The first thing I noticed was how quite it was while boondocking in Walmart parking lots. They use 2 lb. 2″ virgin foam vs. most others at 1.5 lbs. 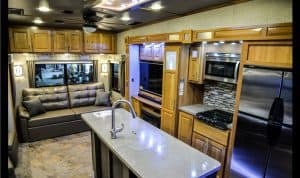 I would suggest anyone looking to spend their hard earned funds, take the Outdoors RV factory tour in NE. Oregon. (LaGrande OR.). By the the time you finish you’ll put down a deposit. Wayne and Steph from Corpus Christi, Tx. We are regular on youtube and ran across your youtube channel and blog, thanks for all your research and hard work. 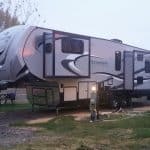 We currently have a 2005 39.5 Fleetwood triumph, and it has been a very good RV for many years, however we are ready to retire and hit the road, and not wanting to put 10K into this 12 yr old rig. 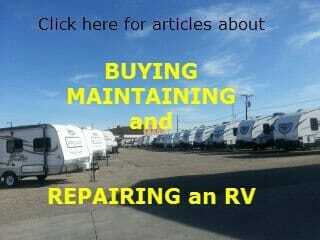 The RV business is booming in Texas and you can drive I35 to Dallas/Fort Worth and there are 2 dozen RV dealers. We have the quantity but quality is questionable. We love the ORV builds and we are sold on their quality, however it is 1800 miles to Oregon and 1,300 to Casper. Are there any dealers down here that can service an ORV? 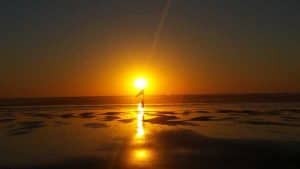 Hi All: Are you 100% retired now or will you still be at the dealership this summer. I would rather buy a unit from you if at all possible. Sounds good Al. October is actually when we will be buying. Spending next summer of 2019 in Alaska. If I order it in October then I should receive no later than March of 2019. That way I don’t have to pay for storage fees. I know they’re doing their next build in Sept. I HOPE they do another build sometime in late winter (like Jan/Feb 2019) – but – there isn’t much of a pattern to bank on – build #1 was 2/17, build #2 was 10/17, build #3 is 9/18, build #4…??? Worst case, I’ll work with you to find one built in Sept. that remains unsold in March 2019. The only downside to that plan is you’ll have to take what the dealer has on his lot – not necessarily with the options you want. A couple hours ago I brought my wife back to the dealer in Mesa AZ. They have a F30rks in stock Mountain series we looked at. Her comment to me was “why is the kitchen so small, and why don’t they have a island. She’s concerned about counter space for the coffee maker, toaster. and her crock pot. I told her when the slide outs are in there is no room for the island. Is this a sensible response. If I ordered the rv next month what is the required deposit or down payment to start the build. Also is it wise for me to have the factory install the generator and solar panels during the build, or should I purchase these items myself and install after I take possession. Regarding small kitchen – I was concerned as well. Turns out it is sufficient. By the way – I have a 30RKS here in Titanium & a 30RLS in Mountain. Between the two, I prefer the rear living room. I have a coffee maker on my counter (and a water filter device) and I still have plenty of space for food prep. The reason for no island (which I am a fan of) is the living area is about a foot shorter than most 33/34 ft trailers and that tightens up the living area just enough to make a center island more of an obstacle than it would be otherwise. Frankly, there is a Grand Design whose floor plan (in the living area) I preferred, but then I realized the foot (or so) that’s been cut from the living area is what allows them to create what I see as an exceptional bedroom/bathroom – the storage (as I point out in my review video of my 30RLS on my website) in the bedroom is great; the room to move about is also generous and the size of the shower stall and the bathroom vanity is also exceptional. So… in both the 30RKS and 30RLS, no go on the island (though after market you could get a portable island if it were that critical.) I have opted against that. If you wish to proceed, I can get a build sheet for the upcoming Glacier Peak build and see about the options they have listed for the models they plan to build this fall. Does ORV have a comprehensive site I can go to pick out any extras I want for the 5th wheel. They do have a few options on the ORV site but it only has a very limited selection. Hi Al: After my wife did her own research on the F30RLS and we went out and viewed a couple she decided this is not the 5th wheel she wants to spend time in. Her main concern is it has no interior character, no cabinet space and no island. I wanted to inform you immediately before you spent any more time getting paper work for me. Sorry for the inconvenience. Bob, I’m truly sorry for you to hear this. I’d welcome the opportunity to speak with her and address her concerns. Frankly, to get something better in this length, you’ll have to go to New Horizons, spend 3x the money, and need a F450 or better to pull it. And I’m not exaggerating. Based upon my experience and research, if you limit yourself to 35ft or less, the Glacier Peak is THE camper to own. I’d love to hear if you find another that meets it for quality. Briefly, regarding your wife’s concerns – regarding the island – I wish they made one as well, but they can’t and still do what they’ve done in the bedroom/bathroom complex – which is head and shoulders above almost any other in the industry AND stay under 35 ft. As to cabinet space, I can speak to how to maximize and improve upon what they’re providing you with. 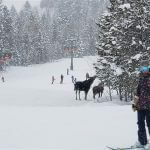 As to interior character – they’re going for a new england ski lodge atmosphere and as such were not looking to create lots of flash (which usually hides substandard construction) that other companies strive for. The best company that does “flash” is Forest River… if you go that route, all I can say is good luck. She likes the Grand design Reflection 320MKS. It’s 34’8″ long, GVWR is 13,995, so I can still tow with my F350 Limited. what I don’t like about the Grand design is they use Westlake 16″ H rated tires, and the hitch pin is a Trail light or something like that. I’d much rather have the Good year G rated tires and the Mor ride hitch pin. I’ll definitely be switching out the tires to Good year. These were the 2 RVS we were interested in from the start. My wife loves to cook and spends a great deal of time in the kitchen. Having cabinets and counter space is a big deal for her. I can show your wife how I modified my cabinet behind the TV to turn it into a pantry (3 drawers that are on rollers), further, I’m planning to remove the dining table and replace it with a custom piece of furniture that will add drawers, cabinets, surface space, and still retain dining space for 2. No steel plate above the tires where GP has a steel plate that separates the tires from the inside of your camper! Grand Design is using the new style stairs which I see as a trainwreck – you can NOT hook up to the trailer while your stairs are still down or you will destroy these stairs! Further, they lift up and store INSIDE the camper – so whatever is ON the stairs will end up IN the camper. Many (most) rv’ers like to hook up while stairs are still down so you can do a final check of the inside before taking off. Glacier Peak has insulation in the slide out (2″ thick) in the ceiling & walls – I don’t believe GD has this. I’m sure that there’s a market out there for people that already own glacier peak’s that need your custom piece of furniture. I really mean that. It could be a nice little addition to many GPs. Where the GPs is a 365×24/7 camper underneath, that could help make up the ground, where the other RVs have more in the way of aesthetics. Thanks for your kind words. I can tell you ORV (Outdoors RV) is aware of the modification I made to the cabinet in my 30RLS behind the TV and they’re looking into the viability of incorporating sliding drawers into future builds. I also plan to share the change I’m making to the dining table as soon as work is completed. Other companies are likely not nearly as interested in anything that costs extra as they are very ‘bottom line’ oriented. 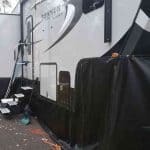 You also mentioned “minimum standards” – the unfortunate reality is there are NO minimum standards in the RV industry. If people will buy it, they will make it. As to other Glacier Peak owners, I’m sure that some (many?) are following my posts and as I do updates, they can update their trailers as they see fit. Al, question about the F30RKS — if all slides are in, can you walk into the kitchen? Can you reach inside the refrigerator to stock it with items? Thanks for reaching out. You’ve identified one of the best 5th wheel trailers you could possibly own – and you know I’m in one myself! In the 30RKS, when the slides are in, getting to the fridge would be impossible. That said, you can easily operate the slideout and in about 40 seconds have full access to the fridge. Your slide motor will operate off the campers 12 volt battery system – which is recharged as you drive. So, if you are traveling and stop at a grocery, park your trailer, do your shopping and then slide the slide out when you return to your camper and load your fridge. I often park a bit away from the entrance to the grocery store and try to park along the edge of the parking lot so I can slide out a slide (or two) to do anything in the camper while I’m in the grocery store’s lot. Thanks for the quick response. Sounds like there is a work-around for the grocery trip! Just would have to pull all slides back in if i am boondocking ovrnight in a Walmart parking lot, for example. The Glacier Peak sounds like a well-built and reliable rig which is important to me as I would be travelling solo. I will also want to stay in state and national parks so short length is better. Trailer, 5th wheel, trailer, 5th wheel…hmmmm. Yep, all good points. If you want a GP, I still have 2 left on my lot. There is NO firm date for when more “30” models will be built. Hi Allan: I heard ORV will no longer manufacture 5th wheels. Is this true? If so what in your opinion is a good 5th wheel in the 34 to 36′ range. I decided against the Grand Design Reflection. There not as well built as they should be. I walked in 1 at a dealer in Mesa Az and felt like I would go through the floor. Just don’t understand how manufacturers can let issues like this get out to dealerships. No quality control at all. Not true. I know for a fact that the 26 and 28 Glacier Peak’s are scheduled for a build in August/Sept., the 30 models are not on the calendar at the moment, but a build is anticipated in mid-autumn. A GREAT 5th wheel in the 34-36ft range IS the glacier peak – and I happen to have 2 of them in stock at the moment – but – when they go, it will be quite a while before we get more. Hi Allan: My wife changed her mind and now she likes the ORV. I’m ready to buy. Do you have the F30RLS in stock anywhere. Send me a personal at boblacourse@hotmail.com and I will get you my cell # so we can discuss price. Hi Al: Yes, we want the 2018 Glacier Peak Titanium F30RLS. I’m also having my fuel tank switched to a 63 gallon tank. I purchased a F30RDS in August of 2017. It turns out that ORV has discontinued this model which is a shame because the rear dinette is more useful than a table and chairs and the large rear window provides a great view over the RKS model and the TV viewing position is better than the RLS. We camped (Full hookups) for 3 months in Breckenridge CO (altitude 9,500 ft) this past winter. We bought a full skirt from Custom Skirting in So. Dakota and highly recommend them. On days below 10 deg F the 35K propane heater can only maintain about 60 deg F. We used 10-15 lbs of propane per day. However, the electric fireplaces are wonderful to make the inside well above 75. We have also camped in 90 deg F heat and the single AC is adequate. The basement storage volume and tank sizes are big advantages over most other fivers. The 12 cu ft fridge seems much larger than our previous 8 cu ft unit and we have fed 3 adults and 3 ‘tweeners’ for 5 days with it. The battery storage space is also an advantage as it holds 4ea 6 VDC AGMs. We recently had an “opportunity” to demonstrate the capability of the tires and off road suspension when we were detoured onto a narrow, muddy, and steep dirt road for 7 miles in Routt county. I wish we had a video of that to show our 4 wheeler friends the capability of a GMC 3500 and a 15,000 lb fiver but the folks on the road behind us gave a big thumbs up at the end of the detour. One big plus for ORV has been the support of their warranty dept. They have provided assistance and advice for every item that we have contacted them. I have added a Xantrex 3012 inverter/charger and so boondocking is great. A future addition will be solar panels. For now, we are very pleased with this ORV product. As you point out the length has proven to be just right for many campgrounds.